What type of varnish should I use to seal acrylics on canvas? Reader Question: Is there a particular varnish to use for acrylic on canvas? First, you will need to choose whether you want to use a brush-on varnish (the most common kind), or a spray varnish. I personally prefer to use a brush-on varnish because I feel it gives me greater control over the outcome, but some people might prefer a spray varnish (this links to Blick Art Materials, and if you make a purchase I get a small commission that helps support this site). Since I am more familiar with brush-on varnishes, I'll tell you more about those. Next, you will need to decide between using an acrylic polymer varnish or an acrylic resin varnish. In general, acrylic resin varnishes are glossier, stronger and clearer than acrylic polymer varnishes. 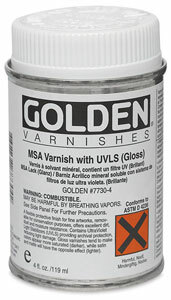 Therefore, if you want a high-gloss finish, you should go for an acrylic resin varnish such as Golden MSA Varnish. Before applying the final varnish, you'll need to apply an "isolation coat" over the entire painting. This is especially important if you plan to use a matte or satin varnish, which may otherwise appear cloudy if an isolation coat is not first applied. The usual recommended mixture for an isolation coat is 2 parts of Golden Soft Gel Gloss mixed with 1 part water. After the isolation coat has thoroughly dried, you can then varnish your painting. The downside of acrylic resin varnishes is that they are toxic if inhaled, so you will need to apply the varnish in a well-ventilated area. To thin the varnish and to clean your brushes afterwards, you'll need to use mineral spirits. Acrylic polymer varnishes, on the other hand, are non-toxic. They can be diluted with water and you can wash your brush with regular soap and water when you are finished. If you plan to use a satin or matte varnish, then an isolation coat is also strongly suggested. Three brands of acrylic polymer varnish that I would recommend are: Golden Polymer Varnish, Liquitex Acrylic Polymer Varnish, and Lascaux UV Varnish. As you know, Golden is my favorite, but that doesn't mean the other ones aren't just as good. When there are several high-quality brands available, it all boils down to personal preference. You can also choose between a glossy, satin or matte varnish. Glossy varnish will really bring out the colors in a painting (which is probably why I prefer glossy over satin or matte). Satin and matte varnishes will create less glare ("glare" referring to shiny reflections that can appear when light hits the painting in certain ways), but satin and matte varnishes will also soften the colors. The matte varnish will actually lighten darker colors. If this appeals to you, go for a satin or matte varnish. Matte varnishes are usually extremely flat, and satin is somewhere in between glossy and matte. You can mix glossy, satin and matte varnishes to get your desired finish. You can also apply one type on top of another to alter the look of the final varnish. Before you varnish your painting, read through my page about how to varnish an acrylic painting, where I give tips and instructions about the best way to brush varnish onto your acrylic painting. In general, it is always recommended that if you are trying a new type of varnish for the first time, do a test application first on a small piece of painted wood or canvas to make sure you like the final result. This is especially recommended if you will add an isolation coat, because the isolation coat and the varnish may alter the final look of the painting. To test the isolation coat and varnish, apply them to a small painting that has similar colors and values as your "real" painting - that way there will be less surprises when you coat the actual painting. Don't worry, you won't have to do test applications every time you want to varnish a painting - you only need to do it if you are trying a new varnish, a new varnish + isolation coat combo, or if you are varnishing a painting that has radically different colors and values than your previous paintings and you want a better idea of how the varnish will look. To help fund this site, I receive a small commission from purchases made via the link below. With that said, I happily use Golden Acrylic Polymer Varnish (glossy) to varnish every single one of my paintings, and I am totally happy with it! Hope that helps and Happy Varnishing!